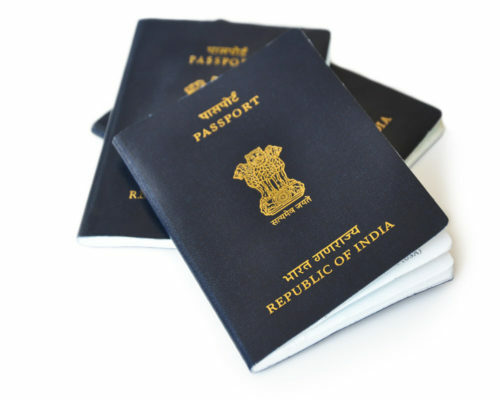 A Passport is a must-have document for anyone wanting to travel abroad for any possible reason. Earlier making a passport was such a tedious and a time-consuming job. However, as a result of globalization more and more people are now traveling to foreign countries increasing the demands for Passport and related services. The Ministry of External Affairs (MEA) started the Passport Seva Project (PSP) in May 2010 to meet this demand. This project has made the process of getting a passport as a modest, well-organized, and clear process. 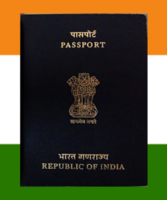 So, let us have a look at the details of getting a Indian Passport. In this article, you will get to know each and every detail about filling the application form and the required documents. 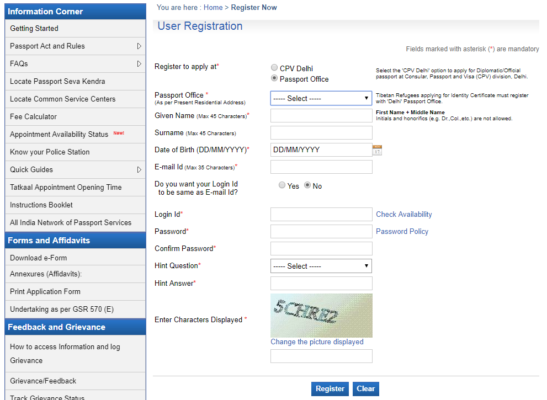 Online passport application requires only five easy steps first one is registering yourself on PSP portal by opening their webpage viz. www.passportindia.gov.in, followed by signing in through your registered ID and password and filing up the application form. 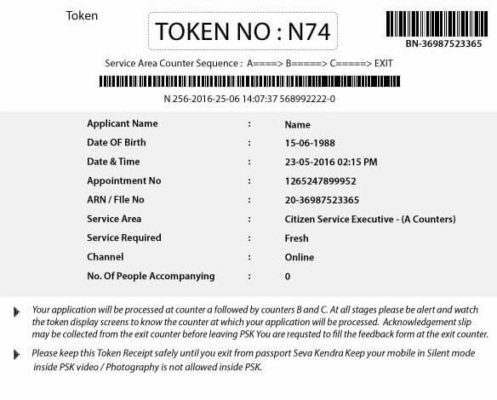 Once you filled all the details in the application form, you need to book an appointment for visiting Passport Seva Kendra then pay the processing fee and finally take you to need a printout of your ARN receipt having details of your appointment confirmation and then visit your PSK on scheduled date and time along with the receipt. 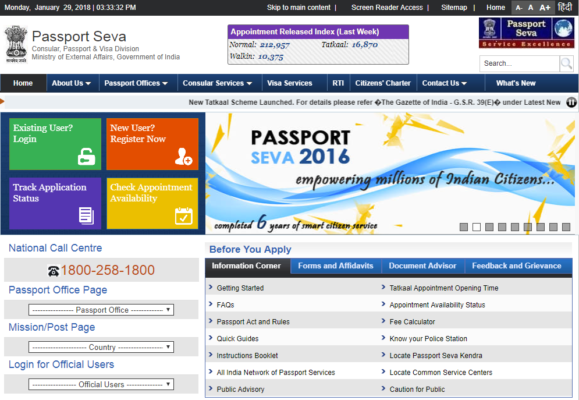 On your browser type the web address passportindia.gov.in, the homepage of PSP (Passport Seva Portal) will appear on your screen, there on the left side you will find a sidebar with 4 options yellow colored log in(for already registered ones), red colored register now (for new users), track application status and check appointment availability. Once you register yourself on this portal, you will get a user id and corresponding password chosen by you for all the future references to the site. You can register by following these steps:-. Choose ‘register now’ option from the sidebar. Then you will be re-directed to the user registration page where you need to fill all the required details in the specified fields (you must have to fill those with Asterix marks, as they are mandatory ones). 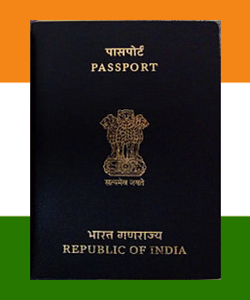 In the first field, you have to choose the place where you want to fix an appointment, for diplomatic/official passport choose CPV Delhi otherwise choose the concerned passport office of your area (you can check the list of passport offices in your city on the homepage). If you are a Tibetan refugee then choose ‘delhi passport office’ as you will need to have an identity certificate fist. Then in subsequent fields, you need to enter your personal details. Afterward, choose your login id(it can also be the same as your email id) and create your unique password. Enter a security question along with its answer. (in case you forgot your password you can use this to get access to your account). Finally, enter the displayed captcha code and then click on register’ icon to get the procedure completed. This is how the Home page looks like. You have to click on the red colored new user registration option. Fresh passport (for the first time applicant) / Passport Reissue (reissue of damaged/lost/stolen or expired passport). Choosing ‘fresh/reissue of the passport’ option on that page will redirect you to the application form. Application forms are available in both online as well as offline options. Offline: it requires 3 steps, downloading the form, filling it and then uploading it to PSP portal. Download the application form. (Note –you require Acrobat Reader version 9 or above for opening the form). (Some people may find offline method as an easy way to fill the form, as it does not require an internet connection, while for those having easy internet access online method will be better). Fresh or a reissue of expired/lost/damaged/ stolen passports. The normal process(1 month time in getting the passport) or tatkal process (1-2 week time of getting the passport). Passport booklet of 36 pages or 60 pages (depends on the frequency of your visit to foreign countries). The validity of 10 years or Up to 18 years of age- for minor applicants, choose according to your requirement. Not Applicable – for adult applicants over 18 years. Once you made all the choices click on the ‘Next’, which will redirect you to the upcoming pages having different sections of the application form having various mandatory details to be filled by you. Like your personal details, education, self-declaration etc. Enter the valid and complete details in all the fields in the form and recheck the form before submitting. If you are satisfied with it then hit the submit button. After submitting the duly filled form, the next step includes scheduling an appointment to visit the Passport Seva Kendra (PSK) and paying the processing fees for the passport. 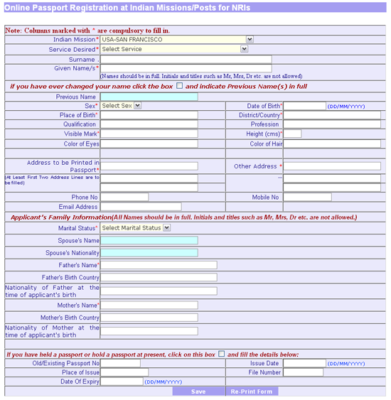 Retrieve partially filled form- to view saved application form. Appointment History- history of already booked appointments is any. 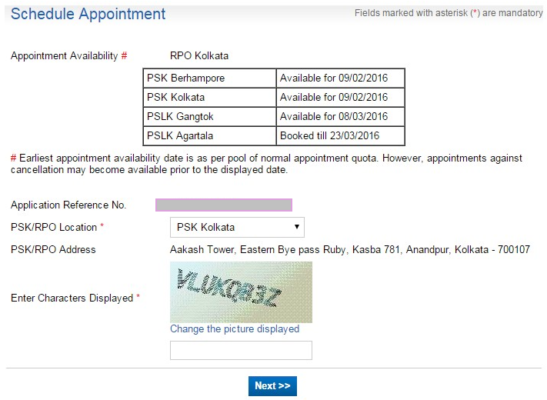 On the upcoming page, you will find available dates for the appointment at PSKs under your concerned Regional Passport Office (RPO). Based on availability and your convenience you can select the date and time of verification at PSK. Enter the displayed captcha code and hit the ‘Next’ icon. Choose between the normal and tatkal quota for making an appointment and payment. Then hit ‘Pay and Book the Appointment’ option. This will redirect you to the payment page in which you can choose between the two options for payment either online or through challan. Online Payment– you can pay via Internet Banking (SBI bank portal only) or through your Debit or Credit Card (SBI as well as others). After completing the payment successfully, you will get the confirmation of appointment and your final ARN receipt will be generated. first, you need to download and print the SBI Bank Challan by hitting on “Pay using Challan” link. Submit the payment to your nearest SBI branch after 3hours of generation of challan. Payment will be marked as successful after at least two working days after depositing the fee in the SBI branch. You can check your payment status by clicking on the “Track Payment Status” link on the applicant main page. After successful payment, you can schedule your appointment and get your final ARN receipt. After receiving the ‘Appointment Confirmation’ you need to print the final ARN Receipt. This can be done by clicking on the Print Application, receipt option. This page will display all the details filled by you in your form as well as information regarding your appointment i.e. your appointment ID, date, time, and venue. Carefully review all these details on ARN and keep this printed page with you as you need to show it at PSK on the scheduled day of the appointment.